The 2009 Victorian Bushfires were the worst bushfires in Australian history, as now published accounts like these attest. 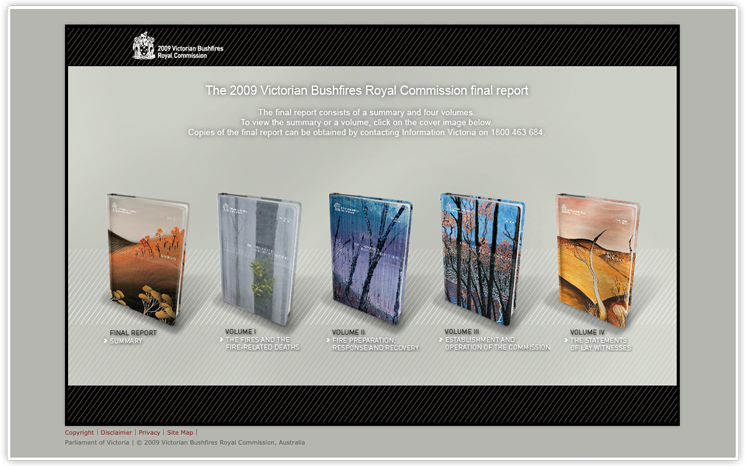 Luminary is truly honoured and proud to announce our involvement in developing the website for The 2009 Victorian Bushfires Royal Commission's final report. "I knew the fire front was coming. You could hear it, you could smell it, you could feel the heat coming up out of the valley ... I could hear a rushing, not a wind; it was different from a wind. It was a white noise you could call it almost ... like a pressure. If pressure could make a noise that is what it would sound like. The flames were right there. They would have been about 50 metres away. The flames were so high. They were the height of the trees and that again ... 300 feet high plus. There were big, swirling vortexes, just big, swirling masses of flames that would just burst and explode out of the ...tree tops." The 2009 Victorian Bushfires were the worst bushfires in Australian history, as now published accounts like these attest. 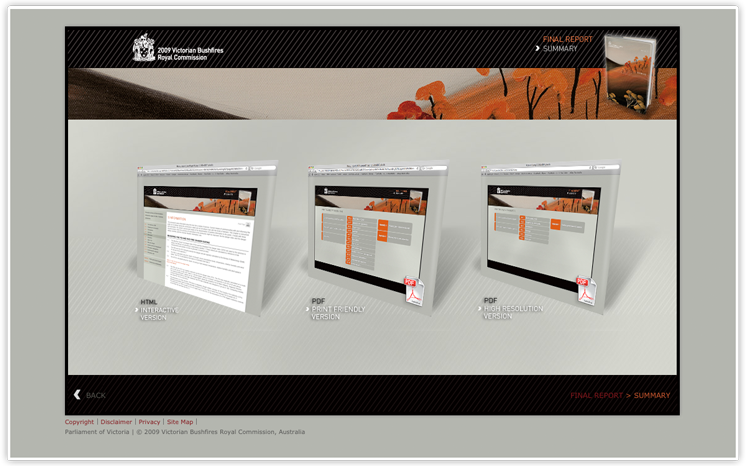 Luminary is truly honoured and proud to announce our involvement in developing the website for The 2009 Victorian Bushfires Royal Commission’s final report. The report was delivered to the Governor of Victoria on the morning of 31 July 2010. Shortly thereafter the Governor presented the report to the Premier who tabled it in the Victorian Parliament. It was then made public online, only minutes later at 11:43. While confident that our servers could handle the traffic (we’d been load testing and planning this for months) there were still tense breaths being held for the opening moments, and then relief as the media, and more importantly Victorians affected by the fires, viewed the report as quickly as they could – online! The opportunity to be involved was a real honour for us. The impact upon the community was extraordinary, and one of the most amazing and eye-opening experiences has been to read through the site, the peoples’ accounts of what happened to them, their family and their property. Being able to provide the general public access to the communities’ photos, their videos, and transcripts of what was said has been particularly satisfying and enjoyable, as well as the submissions that they entered and exhibits that were available. All of this information is now available to the public for the first time. Overall the website itself is around 50,000 URL’s and pulling it together in a short timeframe with sensitive, restricted content was a difficult task. Design was provided by Three’s a Crowd, and the final report was developed in our Kentico content management system over 3 months. In the first few days there were 80,000 unique people who visited the site and downloaded over 450GB of data. Thus far the average throughput (bandwidth consumption) since the site launched is 65 megabits/second. To put this in perspective our 200+ websites combined use an average of 3.5 megabits/second. That’s HUGE! 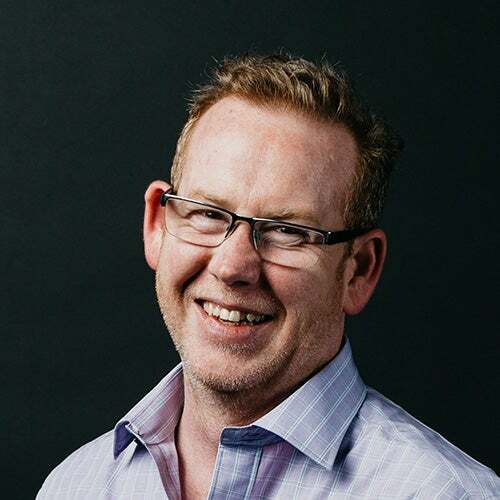 The server environment includes a proxy server, 3 web servers, 2 SQL database servers across 2 linux servers, 3 data centres with connections via pipe networks and a partridge in a pear tree. The partridge doesn’t help server load really, but we like the pears and he won’t leave. Hundreds of videos are being served on a content delivery network called CacheFly which ensures speed (no buffering!) and reliability. Overall there are actually 8 servers involved in a complex structure to ensure stability for the website. We’re happy to say that the website stayed up, and in fact the utilization across the web servers over the launch weekend and the Monday following the press conference was only at 20% so we’re elated we planned and executed the server environment so effectively. Security - the Kentico CMS uses its own security system that is based on the standard ASP.NET security features and it also offers an ASP.NET 2.0-compatible membership provider. In many ways this highlights a tipping point for our company. While we’ve done major projects across companies and the community, helping to bring this website to fruition has been an entirely different experience because of the nature of the content and impact the fires have had on our country. This is Australia’s biggest natural disaster and to be charged with the responsibility of securely handling such sensitive content was often stressful, but at the same time very poignant and meaningful. We as a company have relished the opportunity to step up and deliver a site that is such a technical achievement. As a project to work on it has been fantastic, if humbling. As a natural disaster it was a tragedy, and while we are appreciative of the way we’ve been able to be involved in the project and are proud of our performance, we extend our condolences and support for all those affected.